What makes enclosed trailers a popular option? Enclosed trailers offer many advantages that open-air trailers don’t. Security: Enclosed trailers act as a buffer. Guarding your equipment and important items against the elements and debris kicked up on the road. Another advantage: If you want to go home after a long day and leave your trailer behind at the job site, you can. Trailers can be equipped with securement systems. Also, other security measures that can help protect your equipment from theft. Keep in mind that open trailers cannot provide this level of security. One of the biggest perks of having an enclosed trailer is being able to lock it up and leave it. So, if you’re interested in worry-free hauling, you should be interested in enclosed trailers. Flexibility: Open-air trailers allow you to haul large equipment but don’t provide much additional storage. With enclosed trailers, you have the option to add in cabinets and extra cargo space for tools and any other items needed for your equipment. Promotional potential: Small business that requires you to haul equipment are basically a moving billboard. You can use it to advertise for your business. 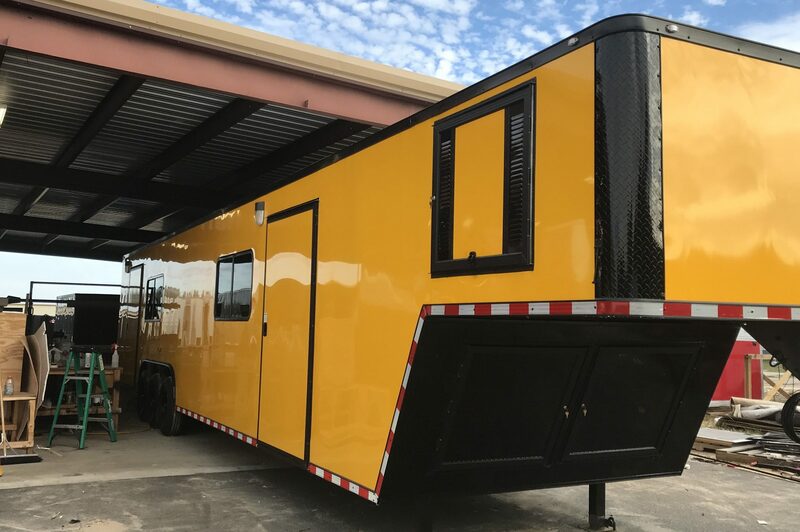 You can customize enclosed trailers with your company’s logo, contact information or any other type of advertising you want. How great is that? Finally, as you consider what kind of trailer is best for your business, keep these benefits of an enclosed trailer in mind. Give us a call if we can be of assistance in purchasing your next enclosed trailer.